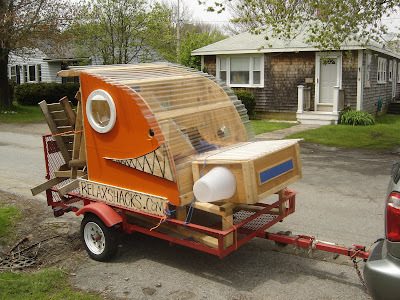 Relaxshacks.com: A Tiny Cabin At The Deerfield, MA Craft/Art Fair- and MY BOOK as a giveaway/free? 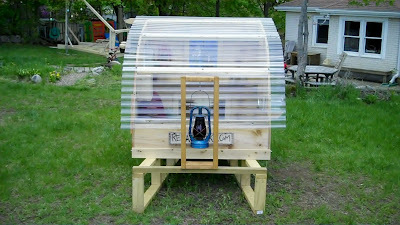 A Tiny Cabin At The Deerfield, MA Craft/Art Fair- and MY BOOK as a giveaway/free? Real quick- again- this SAT and SUN- I'm at the Deerfield, MA Craftsfair, where I was invited to display/yack/hang out with one of my tiny cabins/shelters- so if you're in the area/The Berkshires- swing on by. 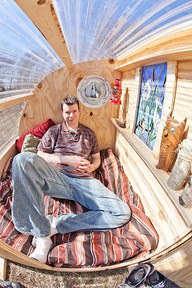 I'll have "The GottaGiddaWay" cabin (as seen in The NY Times, Seattle Times, Treehugger.com, PBS, etc) on hand- some copies of my book as well (the few I have remaining of the old hand-assembled versions- before the new expanded edition comes out). All packed up and ready to go....(the cabin dismantled in its two/three pieces). Um yeah.....we'll be getting some stares on the highway. Front view with a classic Dietz Lantern. If you look closely in the background you can see the very beginning of the framing for what eventually become "The Wolfe's Den" Treehouse- that I later installed in The Catskills/NY.